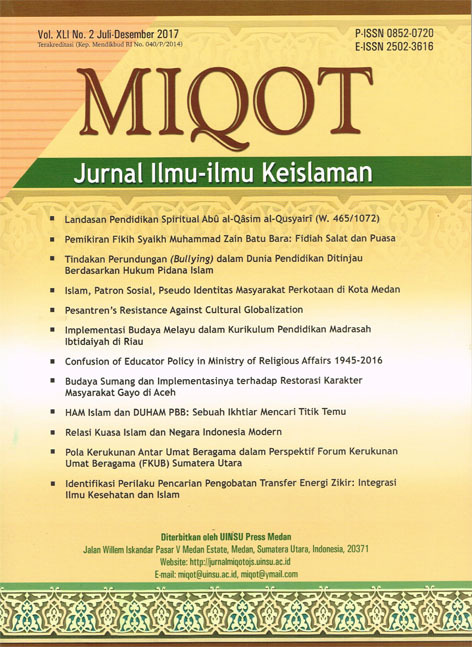 MIQOT: Journal of Islamic Studies is a peer-reviewed academic journal, established in 1976 as part of the UIN Sumatera Utara Medan. MIQOT is dedicated to the publication of scholarly articles in various branches of Islamic Studies, by which exchanges of ideas as research findings is facilitated. MIQOT welcomes contributions of articles is such fields as Quranic Studies, Prophetic Traditions, Theology, Philosophy, Law and Economics, History, Islamic Education, etc. MIQOT: Jurnal Ilmu-ilmu Keislaman involves a number of scholars in the field of Islamic studies. MIQOT has been nationally accredited as scientific journal for several times. First, through the Letter of Dirjend DIKTI Depdiknas RI No. 02/DIKTI/Kep./2002. Second, SK Dirjend DIKTI Kemendiknas No. 64a/DIKTI/Kep/2010. Third, SK Kemendikbud RI No. 040/P/2014 (See: video History of MIQOT: Jurnal Ilmu-ilmu Keislaman). MIQOT: Jurnal Ilmu-ilmu Keislaman has become a CrossRef Member since the year 2018. Therefore, all articles published by MIQOT will have unique DOI number. MIQOT also has indexed by DOAJ, Index Copernicus, Globethics, BASE, TEI, SINTA, Indonesia Onesearch, ISJD, and IPI.